The Japanese sure don't make games like the rest of the world. 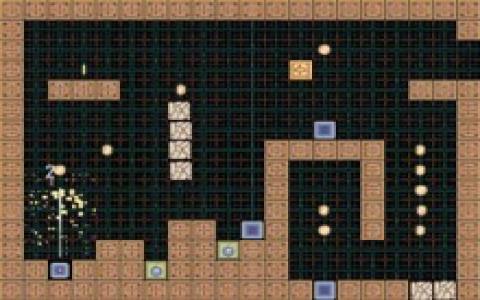 This is a puzzler where the entire maps are made of blocks, a nice choice. I really love it, as if you take a closer look, the game is your usual escape the map puzzler. There are all sort of boxes in this box world, some which offer you special attributes. You hop on each of them, but some offer you special hopping characteristics. That way you have to think your strategy from the moment you start the level. You have to calculate your hopping so that you will reach the exit ina s little hops as possible. But, thankfully, the game is paced very nicely, so you will have the time to learn the basic mechanics so that these won't hinder you later on, when you have to really go for it. So, basically, the game tests both reflexes as well as strategic thinking, and a nice combination of both will allow you to emerge victorious out of every level, but be prepared to retry some levels! A similar game could be, and no I'm not joking, American Football because of its strategy that that gets tested in action sequences. Oh, well, maybe that's a bit of a stretch, but if you want a puzzler to play against this one, try Tap a Jam, another game that aims for equilibrium of puzzle and action bits.